Tomorrow night brings the annual Mansion House (MH) speech, the most important of the year for the Governor of the BoE. While some MH speeches have been dull affairs, with the Chancellor taking the limelight, the Governor tends to use it to make significant policy statements or announcements. Indeed, I would say that it has been more important over the years (to UK policy and markets) than, say, Jackson Hole speeches have been for the US. Up until this point, Governor Carney had positioned himself (and had tried, but failed to take the MPC with him) at the dovish end of the MPC spectrum. The preceding MPC folly around attempted forward guidance, combined with the one-sided nature of this comment (ie he could have chosen to say “sooner or later”) was taken by markets as a clear signal that the Governor had changed tack, and that the MPC would soon be voting for a rate hike. The chart below shows the impact on the sterling OIS curve of Carney’s MH speech. It was worth around 20bp across the curve, a massive single-day move. It also shows what the MPC have done since then, and what the market currently prices for Bank Rate. So while Carney was suggesting that the MPC could hike earlier than around May 2015 (and markets responded by bringing forward expectations to November 2014), the first rate hike is now not fully priced until August 2016! 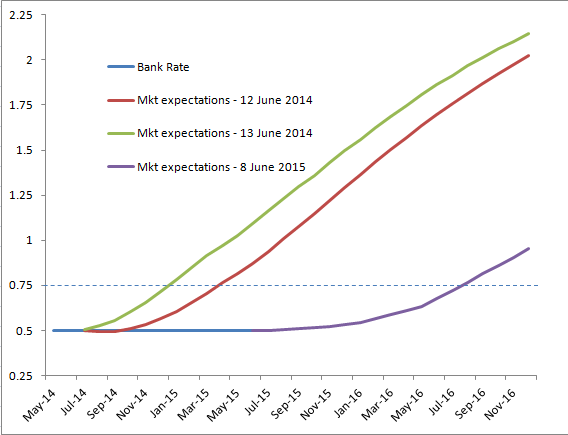 Perhaps even more striking, is the over 100bp difference in rate expectations at the end of 2016. 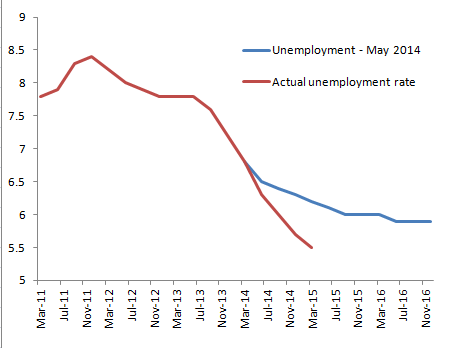 So how did the market (and Carney) get it so wrong? 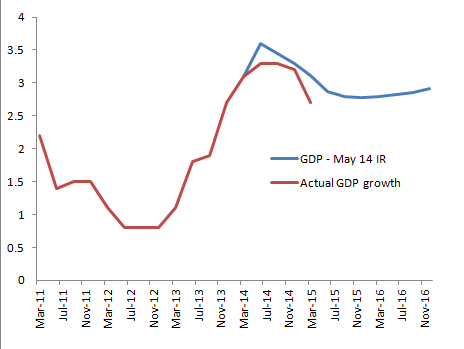 Back in the May 2014 Inflation Report (IR), the Bank had been forecasting GDP growth to remain above trend through 2014, 2015 and 2016. Based on the latest growth data, that has so far broadly panned out, with growth disappointing only a little. So far, not a lot to make you think that policy should have turned out to be so much looser than expected. But that isn’t really enough to get you there either, as the MPC have been keen to point out that from a policy perspective they are looking through the first round impact of lower food and energy prices on inflation. Unfortunately the MPC do not publish core inflation forecasts, but I suspect that it has come out around half a percentage point lower than expected. 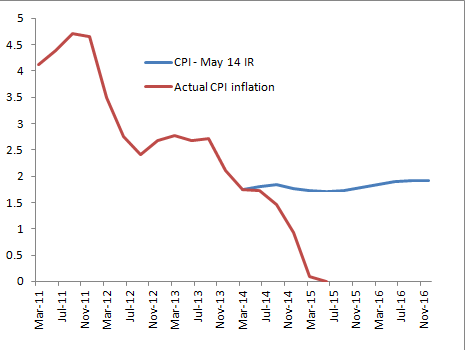 It is also worth noting that the latest inflation forecast is slightly higher than that from May 2014 over the relevant policy horizon. One may appeal to very different conditioning assumptions for market rates as a way of squaring the circle here, but even on the constant rate (0.5%) forecast, inflation is currently expected to be almost exactly the same in 2017 Q2 as what was expected a year ago. In my opinion, the market read far too much into Carney’s apparent about-face last year. I don’t doubt that he wishes he had of been more balanced in his language (a kind way of saying I think he messed up his comms), but there was simply no chance that the MPC was going to be ready to hike in November last year. The domestic economy was performing well, but there was no sign of wage inflation and Europe was on the slide again. Roll forward a year, and the situation is pretty similar. The domestic economy continues to perform well (notwithstanding a surprising dip in growth in Q1 and continued disappointment in productivity growth), wage inflation remains weak (although has started to show some sign of picking up) and the euro zone has finally got the policy stimulus it has needed for years from the latest QE programme. Of course the oil price shock has come at a time when core inflation was still below target (as slack is used up), sending headline inflation negative. That presents some risk of inflation expectations de-anchoring, and given the fragile nature of the recovery, is probably enough to have delayed hiking rates a bit (say 6 months later than what was priced pre-MH 2014). So just as I think the market got into the wrong mindset a year ago by bringing rate hikes forward, I think it has swung too far in the other direction. While we are not at the extremes of a couple of months ago (when some probability of rate cuts were actually priced in the near-term), I still think that a rate hike this year is entirely plausible. And with almost nothing priced in for November, it seems to me like a great asymmetric bet to sell L Z5. Of course if the first hike was to happen in November, then we could see a material steepening in the curve (both for hikes and term premium). No doubt Fed policy will matter a lot for the UK curve as well. If Carney sounds hawkish tomorrow night, will we see a 20bp sell-off? It’s possible, but I doubt he will throw a curve-ball this time. The MPC seem content to stick with their version of “data dependence” and “gradual and limited hikes”. I expect that market volatility will get a mention in his speech though. Central bankers are currently treading a fine line between where they were a year or so ago, when many were saying that volatility was abnormally low, and showing concern about too much volatility today. Draghi’s comments last week, where he said that they would be looking through market volatility when setting policy, seemed to be interpreted as the catalyst for a further sharp sell-off in Bunds. I expect Carney would be of much the same view with his MPC hat on, but might have a slightly different take with his FPC hat on.